This gorgeous greenery-wrapped live/work space in Linkebeek, Belgium was completed by Samyn and Partners in 2007 after 8 years of construction. In the original plans, Samyn and Partners designed the building’s walls to be covered in ivy, while a patinated copper material was chosen for the roof. It’s a blessing that this project took so long to complete -- during construction, the original concept for a “green” façade grew stronger and the ivy and copper roof were scrapped in favor of a lush living envelope that features a selection of exotic plants chosen by botanist Patrick Blanc. Dubbed Milly Film, the mixed-use building is designed to serve as a cinematographer’s residence, production studio, and workspace. The design began with the decision to maintain the existing structure of a small one story house on the ground level. The renovation provided structure for the entry, office and kitchen for the residence, and the living room and stairway extend to the rest of the building. The production studios are housed mostly in the cellar also take up a small section on the second floor. With the addition of a mezzanine, the second floor also features a master suite and bedrooms and bathrooms for 5 children. The mezzanine is protected by a textile netting and offers an expansive view through the the building’s grand glass wall façade. The vegetated facades face north, east and south to enhance privacy. Since a west-facing window wall will receive an excessive amount of sunlight in the summer months, immense translucent white polyester curtains hang from the ceiling to the ground floor to ensure efficient shade for optimal heating and cooling control. Samyn and Partners worked together with Patrick Blanc to finalize the Vertical Garden concept. Through careful planning the team determined the necessary support systems, insulation and water-tightness necessary for plant life. Felt stapled onto rigid PVC panels acts as a support system for irrigation and fertilization of the building’s beautiful green façade. Given the orientation, my criticism is with the response - I am not convinced that this response was the only solution available. To be effective, west-facing glass should be shaded on the outside - in this case it is my impression that it is inside, or am I mistaken? 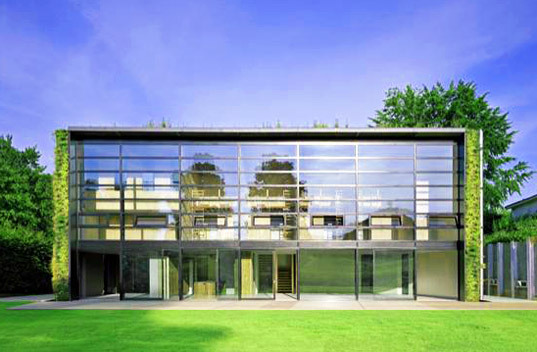 Many beautiful solutions are possible - If you like Rudolph or Corbusier, they created many... It seems to me that for this house the aesthetic conception was prioritized over energy efficiency. Alternatively, a different aesthetic strategy could be chosen and the west-facing wall could be partially opaque - even 50% open provides plenty of view access, and I suspect it would be far more comfortable to live with. If access to light is the concern, South-facing clerestory windows almost always have access to great light. Sincerely, Ryan. Please review the article and photos again before you criticize the orientation. This was an existing building and if you look at the site plan, there are buildings directly to the south, and open land to the west, so privacy & clear access to light are major issue here. Sometimes compromises must be made due to existing conditions. Ryan Enschede I agree with your comments and I at first also had similar feelings of disappointment. This is a sustainable publication and our goal is to provide the world with sustainable design and concepts. Considering the position of the house was not optimal for passive solar design I believe that the architects made a conscious decision to focus on the client's privacy instead. I would also like to make a point that the design of this house evolved over an 8 year period. The design was not driven by sustainable concepts until after original plans were already established. With that in mind I would like to congratulate Samyn and Partners for taking the extra time to edit existing plans and "greening" a specific part the house. Fascinating. The concept of a green roof gone vertical. And you could have it in San Diego (where I live, too) if you used low-water plants (such as succulents) and drip irrigation. A case in point was the succulent cube room at this year's San Francisco Flower & Garden Show. I love that house! Pity is - it must need a lot of water. Couldn't afford it in San Diego. 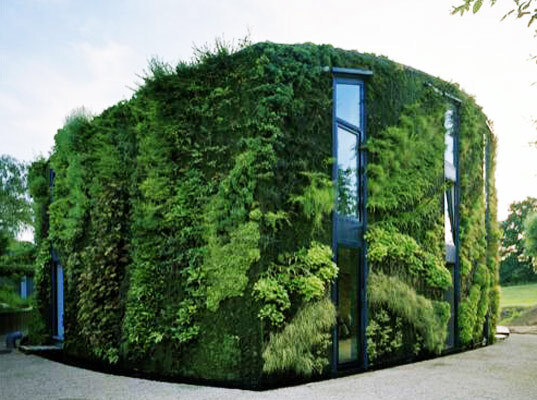 Am obsessed with vertical gardens, and this one is amazing. Thanks so much for sharing this find. Curious as to how the maintenance is for the long term since I struggle to maintain the 6 square feet of garden I have.... Here are some smaller scale vertical gardens I have been wanting to test out: http://www.urbansherp.com/how-does-your-garden-grow Would love to hear from people who have had success with vertical gardens! The design began with the decision to maintain the existing structure of a small one story house on the ground level. The renovation provided structure for the entry, office and kitchen for the residence, and the living room and stairway extend to the rest of the building. The production studios are housed mostly in the cellar also take up a small section on the second floor. With the addition of a mezzanine, the second floor also features a master suite and bedrooms and bathrooms for 5 children. The mezzanine is protected by a textile netting and offers an expansive view through the the building’s grand glass wall façade. The vegetated facades face north, east and south to enhance privacy. Since a west-facing window wall will receive an excessive amount of sunlight in the summer months, immense translucent white polyester curtains hang from the ceiling to the ground floor to ensure efficient shade for optimal heating and cooling control. Samyn and Partners worked together with Patrick Blanc to finalize the Vertical Garden concept. Through careful planning the team determined the necessary support systems, insulation and water-tightness necessary for plant life. Felt stapled onto rigid PVC panels acts as a support system for irrigation and fertilization of the building's beautiful green façade.